Coat large saute pan with oil. Season chicken with salt and pepper. Brown chicken over medium heat, about 7 minutes on each side or until no longer pink. Sprinkle chicken with cumin, garlic powder, and Mexican spices before turning. Remove chicken to a platter and allow to cool. Pull chicken breasts apart by hand into shredded strips. 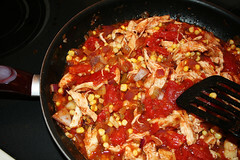 Add shredded chicken to saute pan, combine with vegetables. Microwave tortillas on high for 30 seconds. This softens them and makes them more pliable. Coat the bottom of 2 (13 by 9-inch) pans with a ladle of enchilada sauce. Using a large shallow bowl, dip each tortilla in enchilada sauce to lightly coat. Spoon 1/4 cup chicken mixture into each tortilla. Fold over filling, place 8 enchiladas in each pan with seam side down. Top with remaining enchilada sauce and cheese.